When you look at both the Ateneo Blue Eagles and the National University Bulldogs, they are all too similar. They have a young team with too few veterans and a foreign player who has been largely ineffective. Hence, inconsistency and a tendency for poor play. At the end of the first round, Adamson, NU, and Ateneo all sported identical 4-3 slates. However due to the win-over-the-other tiebreaker, the Falcons were third, the Bulldogs were fourth, and the Blue Eagles on the outside looking in at fifth spot. Sixteen days later, Ateneo is now at third with a 6-4 record while Adamson has fallen to fourth with an even 5-5 record. NU? They have dropped four straight to fall to 4-7 including a 65-50 drubbing at the hands of the Blue Eagles who avenged a first round loss that should have been theirs. Prior to tip-off, I was speaking with one of NU’s assistant coaches who was baffled as well by their poor play. I offered my take on this. As I have previously espoused elsewhere, you can point to youth and a lack of experience as a culprit. In fact, when young teams take a string of losses, it hurts them more and it doesn’t take much for them to further go down. Four consecutive losses? That really hurts their confidence. However, there’s more for the Bulldogs and that’s the poor play of Alfred Aroga. This is just my opinion but I feel that coincidentally, his poor play coincided with the passing of his father. Second, and perhaps more apt is that Alfred is a complimentary player and not someone who will demand that ball and spotlight. Aroga played with some studs who wanted the ball – Ray Parks, Gelo Alolino, and Glenn Khobuntin. When those guys graduated, who is left to take charge? Unfortunately for NU, Alfred has not. And not in their system where the ball moves around a lot. Ateneo took has had that problem when some expected scorers don’t find the bottom of the basket. They become a little easier to defend. Imagine though if Aroga took charge. He can post up anyone he wants. Here’s how Aroga fared in the past few seasons including the pre-season. Against Ateneo, GBoy Babilonia did a great job defensively against Aroga who had only seven attempts and only scored 8 points! Late in the fourth, the Cameroonian got so frustrated with Babilonia that he threw his to the floor then stared daggers at him. How did Ateneo take this game from NU? It started out with defense. The game turned on its head with the entry of Raffy Verano whose great course sense, willingness to mix it up, and play hard-nosed defense led the way. He played the passing lanes, rebounded, and scored inside and out. That last triple that he hit from the left corner pocket? I immediately looked at the NU coaching staff and they slumped back in their seats. That was the dagger right there. But really? How good was the Blue Eagles defense? They contained NU to eight points in the first and second quarters. In the midst of the Bulldogs’ losing streak against FEU, UST, and La Salle, they never scored less than double digits in any quarter. Even if say, against the Green Archers they were blown out. Ateneo seized control in the first half then held them at bay in the second. The final margin of victory and the stats crueller for NU had not the referees made several really questionable calls in the second half that sent the Bulldogs to the line. And of course, there was Babilonia’s defense on Aroga. He finished with 6 points, 8 rebounds to lead the team, and 2 steals. The bench came up big. 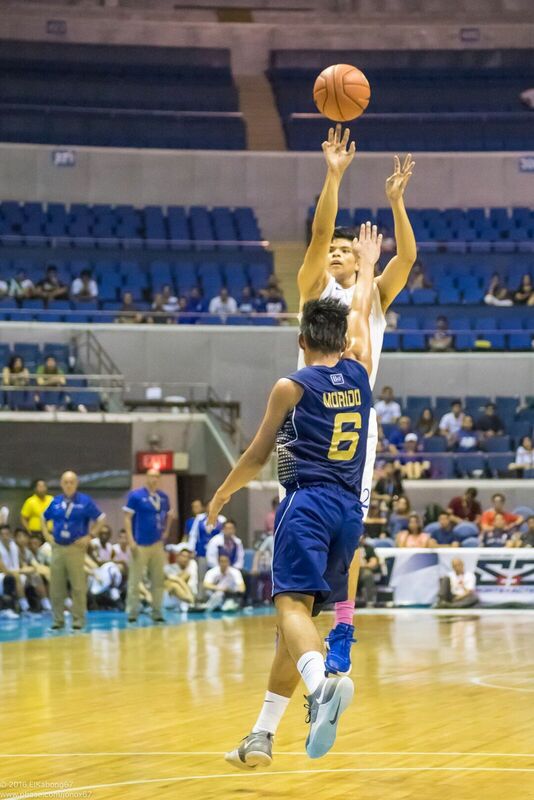 Raffy Verano had his breakout game by leading Ateneo with 20 points, 2 rebounds, and 2 steals. Isaac Go continued his impressive improvement. Big George scored 9 points and grabbed 5 rebounds. His triple over Aroga to end the first half was very very impressive. Aaron Black came off the bench to score 7 points to go with 3 rebounds. All in 10 minutes of play. Better rotation and good coaching. 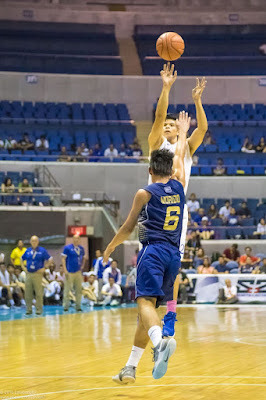 This game showed what the Blue Eagles could really do when they fully grasp what Tab Baldwin wants them to do. Basketball is no different from other sports where you have to read and react. The constant movement, cutting, and passing (hey, there Thirdy Ravena) that at times reminds me of the Princeton Offense requires good basketball IQ. But experience is just as crucial. You can see how other teams like to disrupt that movement up high. A good post player will make things difficult for the defense. The Chibueze Ikeh watch continues. If it can be infuriating to watch Aroga it is triple with Ikeh. Ateneo plays better with Isaac and Gboy on the floor. The player management was smooth. At one point, I wondered why Verano was pulled out with a good 2:28 left in the second period. I thought he should have played through since he was feeling the game. Starting the match, I like how the ball went down low to Vince Tolentino who would read how NU reacted (double teaming and trying to push the Blue Eagles farther from where they like to set up). But the first two offensive thrusts resulted in traveling calls. But I am fine. I like the willingness to challenge inside that I had constantly harped about all season long. Tolentino later found success as he attacked inside. That too set the tone which Verano pushed into overdrive. Ateneo is slowly finding its game. A two-match win streak to even up the earlier two-game slide. That burst of offense finds them second in the league in scoring to DLSU with 734 points a game. Defensively, the Blue Eagles are at fourth. 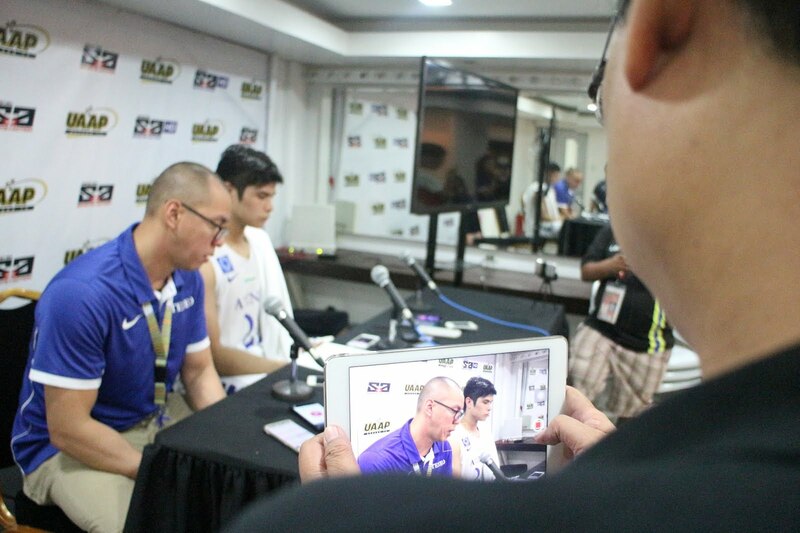 I asked Sandy Arespacochaga what he felt was something the team needed to address and in no particular order, it’s getting Ikeh untracked, the turnovers that were a lot against NU, and the need to get to the free throw line. In spite of scoring a lot of inside points, Ateneo was awarded only six free throws while NU went to the stripe 28 times! If you root for NU, it was a painful loss. There is time to make up lost ground but it is not easy. For Ateneo, it doesn’t get any easier as La Salle is next followed by UST, FEU, and Adamson. All good tests to see how far they can go. isn't verano's dad a former up fighting maroon stalwart who played w/ coach ronnie magsanoc and coach benjie paras in that unforgettable championship team? Alfred Aroga played his best season along side Troy Rosario...they really complemented each other. If Matthew Aquino played he could have supported Aroga with rebounds and inside scoring and taken a load off his shoulders. NU does not want to win!